Originally started as "Arlington Cemetery" in 1865 for Union soldiers of the civil war. 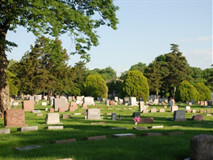 After deciding the cemetery would be more suitable in Leavenworth, the cemetery was given back to the Bluejacket Family. The new name being "Argentine / Junction Cemetery". It remained in the Bluejacket family until the late 1800's. In 1905 a group of prominent citizens in the area, including the Gibbs, Steele and Holsinger families, bought the cemetery, some of the surrounding farm land, and renamed it Maple Hill Cemetery Company. The Argentine and Junction cemeteries remain sections within Maple Hill. In 1945 Lewis Matney bought Maple Hill Cemetery from his sister Anna and her husband TC Payne. Making many improvements and expanding the cemetery to almost 90 acres, ensuring enough space for many years to come. His son Duane "Bud" Matney co-owner of the cemetery, worked along side his father learning since childhood how to operate a cemetery and more importantly, how to treat and help people in their time of need until his father's death in 1987. Like their father, Mike and Danny Matney (Bud's sons) started summer work in the cemetery at a young age. Mike in 1978 and Danny in 1981. Learning the operations from Lewis (Grandfather) and Bud (Father) as well as other family members and dedicated co-workers. Around 1993, Mike and Danny started the succession of the cemetery from their father. Bud Matney was active in the business until his death in 2008. 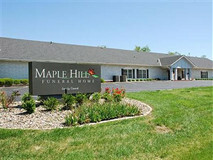 In January of 1973 the Matney family opened Maple Hill Funeral Home and began providing quality funeral services to the families in the Kansas City area. Conveniently located in Maple Hill Cemetery, which the Matney family also owns, the funeral home was under the direction of William H. "Bill" Young, Ethel Matney's son.In November of 2008, with the retirement of Bill Young, his nephew Mike Matney who also owns the cemetery, bought the funeral home ensuring that the Matney family will continue to provide the high level of service that Kansas City has come to expect. To better serve our families we added our own on-site Crematory in October 2018, ensuring your loved ones never leave our care. Currently there are 4 licensed Funeral Directors/Embalmers on staff. Bill Stack III grew up in the Turner area. He later attended and graduated from Shawnee Mission North in 2005. Bill started working in the cemetery in 2001 and helped with evening visitations during the summer of 2004 while going to college at Kansas City Kansas Community College to become a Funeral Director/Embalmer. Bill oversees preneed funeral arrangements and also manages the funeral home staff. Bill and his wife Audra have a son Gage and dog named Scout. Gary Simmons has been a licensed Funeral Director since 1989. In December 2007, following the purchase of Simmons Funeral Home, Gary joined our staff. Gary attended Kansas City Kansas Community College. He enjoys spending time hiking and with his grandchildren and dogs. Eric Batliner has been a licensed funeral director and embalmer since 2009. Eric is a 2005 graduate of Piper High School in Kansas City. After High School he attended Kansas City Kansas Community College where he graduated with an Associate's of Applied Science in Mortuary Science in 2009. Evan Gorrell joined Maple Hill in 2018 after graduating from Kansas City Kansas Community College. Evan attended Cole Camp High School in Missouri where he graduated in 2013. He then attended the University of Missouri where he received his Bachelor of Science in Agribusiness Management in 2017.